Description of "Electronics For You (eBook)"
The EFY Group’s first magazine, Electronics For You, was launched in January 1969, when the Indian electronics industry was still at a nascent stage. Today, it has grown into South Asia’s most popular electronics magazine. In fact, the name ‘EFY’ Group has been coined from the abbreviation of this magazine’s title. 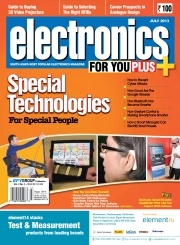 The magazine’s goal is to keep the electronics fraternity updated with the latest technical trends and information. It also keeps hobbyists busy with the circuit ideas and construction projects it carries every month. And it helps end users decide on which electronic product to buy when they enter a shopping mall. The CD that accompanies each issue of this magazine carries a host of useful software and games. Reviews of "Electronics For You (eBook)"